On a relatively quiet side of River St. sits a watering hole that I would categorize as one of my “Cheers” type pubs for both its everybody knows your name feel and cozy atmosphere. It’s The Dubliner, a wood and brick filled, dimly lit bar that appears to have been serving Hoboken for decades, yet it has only been in existence since 2005. 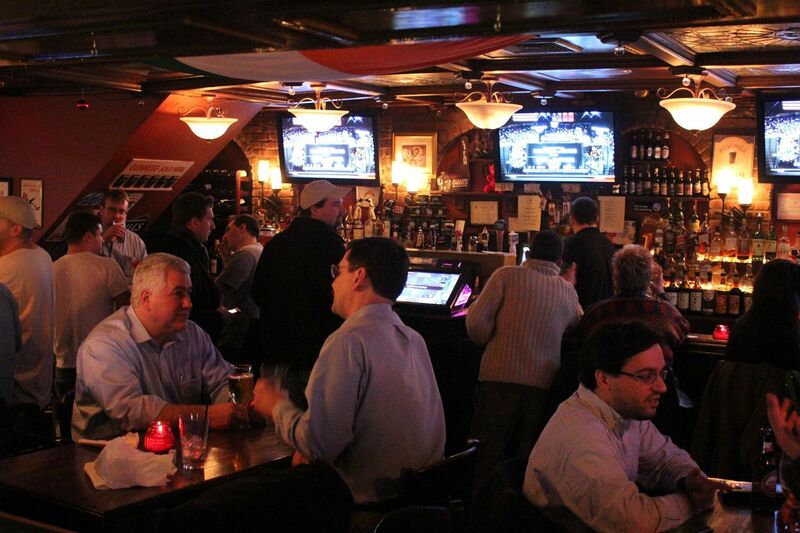 As a resident of Hoboken, I have spent some considerable time at The Dubliner in the past. These visits were short, basically just grabbing a pint after work. But on this visit I took some time to look around and check out to joint to find out why people keep coming back. The group I was with headed over to the bar on a weeknight, which in my opinion is the best time to see how a place truly functions. After passing through the entrance way I spotted a sizable crowd of middle aged men playing darts. These guys were definitely locals so it gave me a sense that this place has become a hangout for regular Joe’s, as well as the typical Hoboken crowd of post college grads. Personally I think that’s a solid mix and keeps the place in check. During the weekends and warmer months, The Dubliner becomes a different sort of bar. The second floor features another bar with plenty of space to hang and during the late spring and summer their rooftop opens for all your outdoor boozing needs. After passing the dart players, we approached the bar, the counter of which has an old school feel, and is surrounded in well worn brick. The seating area however is kind of on the scarce side, potentially due to a hockey game being shown. We then scoped out the draft beer selection, and asked the bartender if we could grab a table in the back. He was a super friendly guy, and said no problem. Not only was he easy going about us not ordering at the bar itself, he actually served as our waiter essentially working double duty. It happened to be Tuesday so domestic brews were $3.50 all night long, but fans of more diverse beers can also rest easy. The Dubliner pours proper pints some of Ireland’s best brews such as Guinness and Swithwicks. Craft beer fans also have a choice of the Belgium favorite Palm, as well as the wildly popular Blue Moon. The seating area was by no means empty on this night, but we found some space to sit down and imbibe some brews. Preconceived notion – I have always considered The Dubliner a great place to relax and they are well known for their burger. Music – A hockey game was on, so I didn’t notice any. Value – Great weekday happy hour specials on domestic draughts. Date – This is a pub through and through. Only take a date here if you’re in a long-term relationship with your mate, and maybe a first date during the summer when the roof is open. Hookup – Maybe in the wee hours of the morning, when the crowd is very drunk. Dance – Downstairs? Not a chance, you may get hit by a stray dart. Upstairs though, when open, can sport a small dance revolution if you’re loaded. Catch up with a friend – Great joint for throwing back several beers while laughing about old times. Overall – What can I say, I’m a sucker for the classic cozy pub. The Dubliner more than exceeded my expectations as a great place to grab a pint, and hang out with good friends. On weekdays, the brews flow cheap, the environment is super laid back, and it’s not the slightest bit pretentious. During weekends and summer the place becomes more lively, with a second level and roof top which adds a healthy mix of people to keep things fresh and fun… I’ll give it an 8.0.